Mid-semester renovations to teaching areas at the Nova Scotia College for Arts and Design have students questioning the institution’s priorities while classes are shuffled around much like a game of tetris. The college is renting out two spaces, the former drawing room and woodshop, for businesses, as a part of its 2012 Framework for Sustainability Plan — more efficient use of space and more rental income for the cash-strapped university. 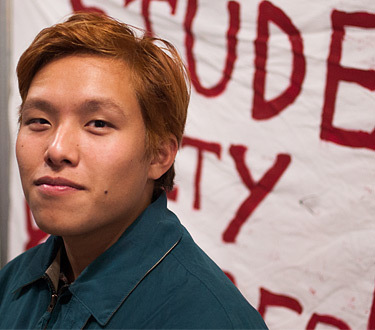 Caleb Hung, vice-president academic of Student Union of NSCAD is in the drawing class affected by the room changes. He says he was only informed about the change two weeks ago after hearing rumours among faculty and students. “We all assumed that (the renovations were) going to be during the summer semester when it’s (more) quiet and less space is being utilized,” says Hung. The sustainability report laid out a plan to rent out as much of the Granville campus as possible. The university’s plan includes moving two multimedia labs to the Academy Building and a painting studio to the Port Campus. This will allow NSCAD to collect an estimated $200,000 from rental spaces in the new year. The university, which is spread out between the Granville Campus, Port Campus and the Academy Building, housed about 980 students in 2012. In December 2011, the provincial government released a report on the school, revealing that NSCAD was in debt to the tune of $19 million – $8 million from the Granville Campus alone. Marilyn Smulders, director of communications at the university, talked to faculty about the room changes and says the new spaces are bigger and will bring the once sprawled out classrooms closer together. She says the university cemented its plans to renovate only when it secured new tenants, so summertime construction wasn’t an option for the school. Student life could be affected by the upcoming construction. Hung says the old drawing studio and woodshop, where the renovations are set to start in a few weeks, share a thin wall with a painting studio that is still in use. He adds that students are worried about the noise and changes in plumbing as well as electricity. Renovations directly below the fashion department have already started and students are noticing problems. Madie Leroux, a fashion design student, was in class when the fumes interrupted her work. She says it wasn’t a big deal and was dealt with quickly with only a few interruptions to her and her classmates. Gabrielle Beauchemin, another fashion student, is frustrated with the room changes and downsizing at the university. She says NSCAD is already efficient and renovations conducted at this point are cutting into the school’s core facilities. “They’re treating the space utilization at the school as an efficiency problem within the school, when it’s really a funding problem on the government level,” she says. Smulders says the school doesn’t want to disrupt students — renovations will be performed when students are out of class to ensure the fewest disruptions. “We’re very sensitive to the students of course,” she says.